Dave Finkle is a Food Artist and Food Expert TV Presenter who loves anything to do with agriculture, horticulture and carving pumpkins. 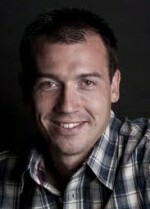 Dave Finkle is a TV presenter, writer, speaker and food production expert. He is also an expert in all things to do with agriculture, horticulture, wholesome living, supermarket activity, consumer affairs (food related) and rural pursuits. Formerly Farm Manager of TV’s famous ‘Jimmy`s Farm’, he is a food artist and a World Record Pumpkin Carver, holding Two World Records too. Passionate about sustainable farming, eating fruit and veg in season, eating British meat, humane slaughter and growing your own, Dave is married with two young daughters. Dave’s farming background is diverse. Passionate about farming, Dave started his agricultural career as soon as he could walk. By the age of 16 he had built up his own flock of 200 breeding ewes. After completing agricultural college, Dave worked for the Ministry of Agriculture Fisheries and Food, became a Prototype Test Driver for CAT UK, lectured at Writtle Agricultural College and was also responsible for the management of a 3000 acre mixed livestock/arable farm. 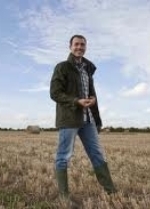 He graduated with a National Diploma in Agriculture and has worked his way through the Agricultural ranks to become Farm Manager of TV’s famous Jimmy’s Farm and working with Jimmy Doherty and Jamie Oliver on a number of projects. Dave also has an artistic streak. 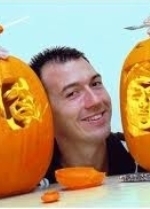 His creative art of pumpkin carving has attributed to appearances on TV shows such as GMTV, Soccer AM, Paul O’Grady Show and the Tate Modern, Harrods, Hamleys, and news papers around the world. Dave Finkle has also set new benchmarks for the single fastest carved pumpkin and the most pumpkins carved in one hour. His time of 20.03 for the first record was three seconds faster than the old mark, whilst 102 carved pumpkins in the 60 minutes was double the old record. His attempts were filmed by BBC One’s Countryfile programme which was aired on Halloween in 2010. He said ‘There was a guy called Stephen Clarke in America who held a couple of pumpkin world records and I wanted them, it was as simple as that.’ The records were the latest chapter in the his pumpkin carving adventure. His 3D carvings of the likes of Michael Jackson, Barack Obama, Simon Cowell and Wayne Rooney have seen him gain national and international media coverage.